My youngest daughter is going off to college at the end of this week. She has a reasonably good idea of what she wants to study, she picked a school with a strong yet not overly narrow focus. It's more specific than "liberal arts" yet not a narrow path towards a single profession either. As my daughter prepares to go off to college, she received in the mail today a little book for one of her classes. It's a reading requirement for a one-credit class that is associated with her housing arrangement. She will be part of a living community on campus, spending a lot of time with fellow students studying related topics and engaging with faculty in and out of classrooms. 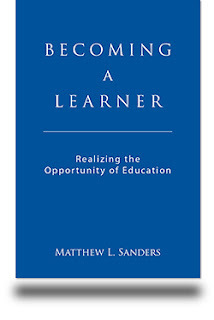 I must admit that my eyes lit up when I saw the title of this little book: Becoming a Learner: Realizing the Opportunity of Education, by Matthew L. Sanders. [As a side note, I get excited just reading the reading list portion of syllabi]. This little blue book should be mandatory reading for anyone going to college. Unfortunately, I'm afraid it's full of bits of wisdom one only realizes are true 20 or 30 years later, when our professional and personal lives have taken us far away from where we probably thought we were going. Yes, but this requires a more detailed explanation of what we mean by becoming a learner. In high school, we have students Students succeed if they become proficient at studying. If you take the highly rated MOOC called "Learning How to Learn," I would argue that you are primarily learning how to study, which still does not prepare you for lifelong learning. College students who continue in that mode of studying may be successful in the short term, but if they do not evolve into learners, their success will be short-lived because they will not know how to continuously learn and grow throughout their professional and personal lives. "Your ability to learn how to learn will be what takes you through the countless industry developments you will deal with in your work and in society. By recognizing this, you can focus on your development as a learner, which will be more lasting and applicable in all your future endeavors." (p. 14). A student is taught by teachers. Learners take responsibility for their own learning, decide what to learn and how to learn it. Faculty are there to guide the learning process in specific disciplines more than to teach. This is really great reading as an introduction to college learning, and I hope it's fully embedded in the classroom practices. If the faculty and entire curriculum design doesn't embrace this approach, it will be difficult for individual students (sorry, learners) to embrace if fully. It will require constant reinforcement. The idea of putting on a broader set of lenses reminds me of a little mental reflex I've developed over the years. When I feel pretty sure that I know exactly where I am going to be in my life in 5-10 years, I smile (internally) and I tell myself that's not where I'll be, but that's perfectly fine, because opportunities will emerge that I couldn't have imagined and if I'm able to keep an open mind and ditch the plan, I'll be able to capture those opportunities. Have a plan, then ditch the plan! The learning process is more important than the specific lesson. That's very similar to what I said last week during the NASA Virtual PM Challenge on Lessons Learned. I was asked what key lessons all project managers should know about. Beyond general good project management practices, the key is to keep learning, not to know about any specific set of lessons hidden in a database.